On a Sunday afternoon at the end of April, I was on a plane headed home. As always, there was a safety video playing with detailed instructions about how to operate your seat belt, the importance of identifying the closest exit (“keeping in mind that the closest exit may be behind you”), and how to find an inflatable lifejacket in the unlikely event of an emergency. Since my husband and I love to travel, I have watched this video and listened to this message countless times. But that day, I was particularly inspired by one of the opening lines of the video. “At Delta, we believe a good trip is not about the destination, but about the people you meet along the way.” I couldn’t agree more. The destination for my weekend trip was a retreat center in St. Charles, Illinois, a suburb of Chicago. The facility was great: plentiful meeting rooms that were clean and well-maintained, scenic hiking trails nearby, friendly and professional staff, and delicious food available just about anytime. Yes, the Q Center was nice. But the people? Oh, the people I “met along the way” were truly outstanding. You see, this was my first NAPO Conference. NAPO, the National Association of Productivity and Organizing Professionals, is an organization composed of thousands of people from all areas of the United States (and a few other countries) whose work involves helping people organize their belongings, their time, and their lives. 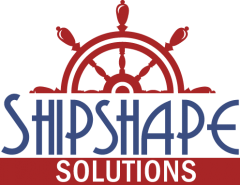 As a new organizer (I started my business, Shipshape Solutions, in August 2016), I was eager to attend my first conference. I knew that the class sessions would give me information vital to increasing my knowledge and skills as an organizer. But I’ll have to admit that I was also a bit apprehensive. After all, many of the organizers attending were seasoned veterans. Having read books, listened to podcasts, and followed email and social media discussions about organizing, I was anticipating meeting some of the “rock stars” of the organizing world and hoping I wouldn’t appear so “green” as to be laughable. Because I don’t live close enough to attend a local NAPO chapter meeting, I knew that I wouldn’t be able to count on having a friend to sit with in the dining room or during sessions. I envisioned a scenario not unlike the junior high school cafeteria, when I would nervously walk away from the cash register with my tray, hoping and praying that I could find a seat at one of the “cool” tables. After checking into my room, it was time to head down to the conference. According to the schedule, it was time for lunch. Oh, great. I’d have to start with the dreaded cafeteria scene. I got my food and started that slow walk. “Look for a smiling face,” I thought, “and just hope for the best.” Since most every person was smiling, I just randomly chose a table, sat down, and introduced myself. By the end of lunch, I knew that it was all going to be ok. Without fail, every single person at the lunch table that day was friendly, encouraging, and eager to make me feel welcome. Once the sessions began, the rest of the weekend was pretty much nonstop. Every presentation was of top notch quality, and I learned so much valuable information. My eyes were opened to the vast opportunities for growth within the organizing profession. Besides general organizing in homes and offices, organizers can write books, install closet systems, teach workshops, help with productivity and time management, produce podcasts, plan complex events, and collaborate with any number of professionals to help a client. Presenters urged us to use our gifts, talents, and skills in unique ways to make our business uniquely our own. Participants freely exchanged ideas, discussed challenges, and encouraged each other to grow. My mind is swimming with possibilities. I have a long list of new things I want to try. I am inspired and challenged to take my business to the next level. I’m so glad I made the decision to attend the 2018 NAPO conference. I can’t wait for NAPO 2019: Education is Bigger in Texas! Previous Previous post: Are You Ready to Reclaim Your Garage?